Managing to cram almost every issue into one sentence and somehow involving zombies – no mean feat – this additional call out adds interest to the the no borders camp. Below is the call out in euro-english. Since the crisis of Greece and the euro in early May, the European Union has become a political zombie: its neoliberal and monetarist brain is damaged, but it continues to create havoc and disaster. Merkel, whose inaction has escalated the cost of the financial crisis from €45 to €45billion, is imposing her mantra on Europe: Austerity, Austerity, Austerity. Cuts in public spending and wage freezes are imposed on a society already made precarious by the Great Recession. Greece, Spain, Italy, France, Germany, Belgium: nobody is sheltered from the attack on the european welfare state by global finance. Against this process, we have to defend social rights and transform european society, resist and create. There’s but one solution which could take us forward : A social & ecologic Europe. where present european élites are finally neutralized, and the present course toward deflation is reversed to subsidize the emerging p2p european democracy. We need to stop financing banks, public spending must support a commons-based economy, creativity and social innovation. Europe must secure an unconditionnal income to all workers, with or without a job. It’s time to get out of productivism and consumerism : it’s time to invest in environnmentally sound ways : sustainable mobility, local agricultural production, deployment of renewable energy, environmental education…. Social spending must be used to strengthen the social networks of solidarity across lands and generations. Only generalized conflict can emancipate the precarious generation and reverse the present trend toward the decline in social spending. Only Europe’s multiethnic cities can defeat the heightened racism of an aging, regionalized, re-nationalized europe. BXL is not only the capital of a small country supposed to lead European presidency although itself has no government yet. BXL, it is also the headquarters of european institutions, like the european commission, detaining the exclusive power of proposing and developping new legislations, making it a primary target for lobbyists. Because BXL, it is also, and foremost, a lobbying paradise, with more than 1000 of them, 15000 professionals of influence, pushing the interests of big multinationals and globalised finance, for which the crisis is just but another occasion of pulling the jackpot. On 29.9, we will then answer the call made by the european union confederation, even though we don’t share the motto. Growth and Jobs won’t get Europe out of crisis, but generalised ecological transformation and guaranteed income for everyone. Yet, it’s not with a demo that we’ll dismiss ECOFIN but with non violent direct action. 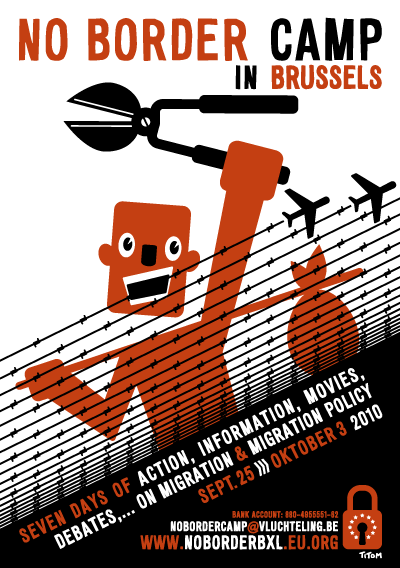 29 September : Critical/Anticapitalist bloc in ETUC/CES Demo. 28-30 September : Streetparties, direct actions against ECOFIN, lobbies, banks and rating agencies.